Looks nice and festive, right? Hmmm. Well, this is probably proof that the top brass at Trader Joe’s are devoted followers of this blog. No sooner do I suggest that TJ come up with a few more variations on their new Toasted Coconut Pancale Mix then does this appear on the shelf – Trader Joe’s Gingerbread Pancake Mix. It’s arrived just in time for the holiday festivities, so let’s dive in! In my Toasted Coconut Pancake Mix review, I pointed out that while the coconut bits are pretty good, the real winner was the incredibly easy to make pancake mix itself. Trader Joe’s has brought to market a totally self-contained pancake kit that incorporates powdered eggs and powdered milk into the mix itself. All you need to supply is the water – either a little to end up with big puffy flapjacks, or a lot to end up with thin, dense crepes. This time around TJ’s ditched the coconut, and whipped up something much more in tune with the time of year – a gingerbread infused mix with crystallized ginger bits tossed right in. While this sounds like it should be a grand slam, the pancake mix suffers from the unique problem of not being gingery enough, and being too gingery at the same time. There are really two types of ginger in this pancake mix. The first is the ginger present in the gingerbread-like pancake batter itself. This is ginger doing the classic gingerbread thing, providing a pleasant aromatic lift to the rest of the dough and contributing just a hint of ginger taste. I was actually a little disappointed by how mild the ginger taste was in the pancake batter. Given the premise of “gingerbread pancakes”, I had assumed we’d be getting something akin to gingerbread cookies, just in a fluffier form. 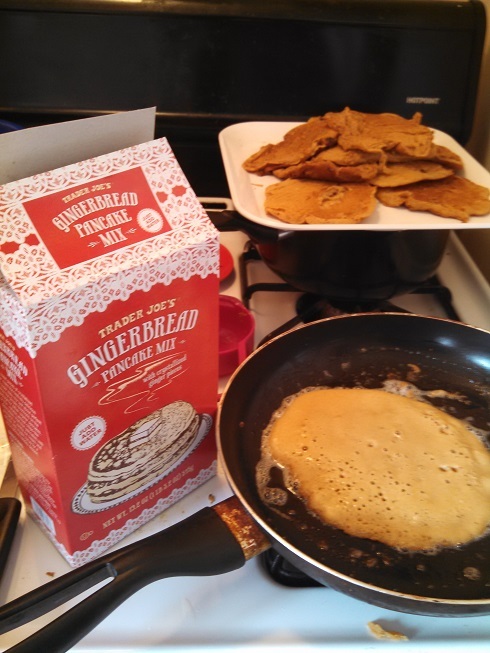 That’s not actually the case – this pancake mix is more gingerbread-inspired then gingerbread-infused. It tastes somewhat of gingerbread, but not so much that you would mistake it for a cookie in a blind taste test. While that’s a little disappointing to me personally, it’s by no means a deal breaker. The molasses, brown sugar and powdered ginger that do go in give it at least a hint of that warm and lovely taste of gingerbread, while retaining the supple mildness of the good ol’ fashioned pancake. However, there is another issue. Possibly in order to compensate for the only mildly gingery batter, Trader Joe’s mixes in a heaping scoop of crystallized ginger bits. Not unlike it’s cousin Trader Joe’s Crispy Coconut Pancakes, the ginger bits are numerous, and wind up in each bite. The problem is that bits of crystallized ginger just don’t taste that great in pancakes. There are a couple issues with it – the abrupt combination of textures, the fact that the heavy bits are prone to burn on the griddle – but the biggest issue is that ginger isn’t really an easy spice to use. Thin-style, the way I likes ’em. actually better suited for savory dishes, as in Indian and Thai cuisine – not sweet ones. Gingerbread only really works because the ginger is spread out through a good deal of sugar and thick batter. The crystallized ginger lumps in this pancake mix don’t taste like gingerbread at all – they just take like intense bits of ginger. These little gingery bursts don’t go particularly well with maple syrup and butter – instead they sort of throw the flavor off by hitting you with an abrupt, strong, clashing taste. And I say this as a crystallized ginger fan! For years I kept a little box of crystalized ginger in my desk drawer to snack on for a little mid-afternoon pick-me-up. I only stopped when it became clear that fusing my molars together with sugar-caked, sweet glue was not beneficial to healthy tooth enamel. In the end, what you’re left with is a pretty tasty gingerbread(ish) pancake mix, with a bunch of intense ginger mixed in. The result is something that tastes less like a holiday treat and more like something from an Asian Fusion brunch special. It’s not terrible – but it is very striking. While it’s certainly interesting to try, if you’re looking for something to delight the kids with on Xmas morning this may not be the way to go. 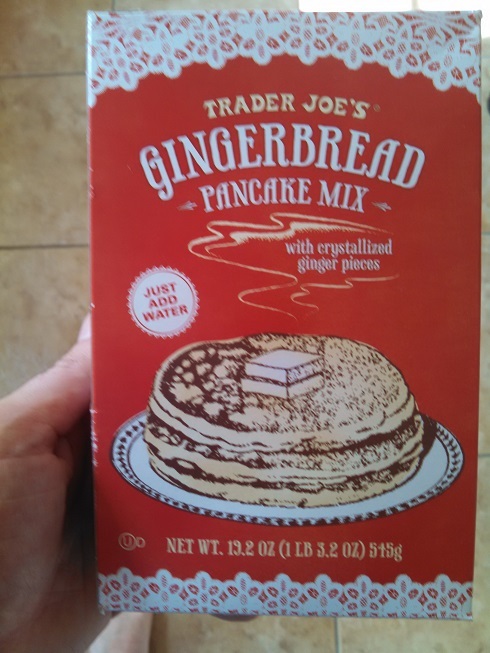 Trader Joe, if you are taking suggestions from me now, keep the pancake mix but don’t stop trying out new flavors. Would I Recommend It: Not really. Ginger pancakes are interesting, but not incredible. Would I Buy It Again: I’ll probably go back to the toasted coconut pancakes. Final Synopsis: Nice gingerbready pancakes loaded up with too much ginger. The TJ’s in my town has a warning posted in front of these that they contain LEAD! California Prop 65. I don’t understand it at ALL. Why in the world did they put lead in them in the first place? Prop 65 requires all California places of business that include any potentially harmful substances (even if it is only found in such places as, for instance, the insulation) to post that warning. Keep an eye out for these signs – they’re posted in practically every business in the state. In this case it’s probably referring to the building, not the food. They are referring to the lead-containing ginger. Wow – yes, all you guys are right. Trader Joe’s is involved in a lawsuit over selling lead-tainted ginger. Apparently this is a problem with ginger farmed in regions of Asia where lax agricultural practices have resulted in significant lead contamination. The lawsuit also involves a number of other grocers, including Whole Foods and Target. Definitely avoid this product, particularly if you have children. Lead exposure is most damaging to still developing brains and nervous systems. It’s shocking that Trader Joe’s has not pulled the product from their shelves, but instead is choosing to simply put up a cautionary sign. I have to disagree! I LOVED these!! Also disagree with this review. I LOVED them too!!! I think the pumpkin pancakes are a bit bland once cooked (although the batter is delicious) but these gingerbread pancakes had plenty of flavor for me and I liked the bits of ginger in every bite too. I wouldn’t change a thing! That is what the sign says. Pretty specific. Awesome Trader Joes needs online shopping. I’ve got to disagree. I thought the level of ginger flavor and the combination of ginger in two forms was Just Right. Delicious! We don’t have TJ where I live (rec’d this in a box of holiday goodies from family in another state), but I’ve already asked for more next year. Aaaand I’ll be requesting some of the coconut, too!